Ribbon: Blue with white central stripe. 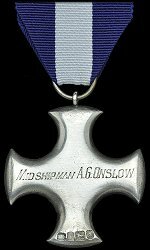 Instituted: 15 June 1901 as the Conspicuous Service Cross, renamed in October 1914. 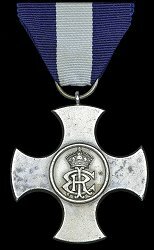 Awarded: For gallant or distinguished naval service in face of the enemy, to officers in the Royal Navy or merchant service until 1993, since then it may be awarded to any rank.